received his B. Sc. in Microbiology and Biochemistry from Lanzhou University, China in 1982, M. Sc. in Microbiology from Chinese Academy of Agricultural Sciences, Beijing, China in 1988 and Ph. D. from University of Sydney, Australia in 1995. He was working at Institute of Soils and Fertilizers, Chinese Academy of Agricultural Sciences, Beijing, China from 1982 to 1989 and working as a visitor scholar in Department of Agriculture Chemistry at Sydney University in 1990. After obtaining Ph. D from Sydney University in 1995 , Dr. Yu went to USA, firstly as a Postdoctoral Fellow and then as a Research Fellow working at National Cancer Institute-Frederick, Maryland till 2000. From 2001 to 2009, he took a position in Lexicon Pharmaceuticals Inc. at The Woodlands, Texas, working as a Scientist, a Senior Scientist and Project Leader, respectively. He was then invited as Scientific Specialist to Sanger Institute at Cambridge, UK from 2009 to 2010. Dr. Yu joined Guangzhou Institutes of Biomedicine and Health, Chinese Academy and Sciences at beginning of 2011, taking in charge of Biotherapeutics Section in Drug Discovery Pipeline. When working at National Cancer Institute-Frederick, Maryland from 1995 to 2000, Dr. Yu with his colleagues invented “Recombineering”, an advanced gene engineering technology. This technology has being widely used by academia and industries over the world to make DNA constructs for studying gene functions and developing drug targets. For recent ten years, Dr. Yu’s work has mainly focused on gene function studies, drug target identification and biotherapeutic drug development. Dr. Yu has published more than 20 papers and submitted four patent applications in USA, one of which was authorized in 2006. He received Scientific and Technological Improvement Award in 1985 from Ministry of Agriculture of China, Beijing, China and Technology Transfer Award in 2000 from National Cancer Institute, National Institutes of Health, USA. Biological macromolecular drugs are therapeutic antibodies, therapeutic proteins， and therapeutic vaccines. Macromolecular drug development usually needs significant investment in research and development (R & D), e.g. drug target identification, recombinant protein production, and humanized antibody development. However, macromolecular drugs, especially therapeutic antibodies and therapeutic proteins, are drawing more interest in fields of drug and therapy as they are more specific and exhibit less side-effects compared to small molecule drugs. 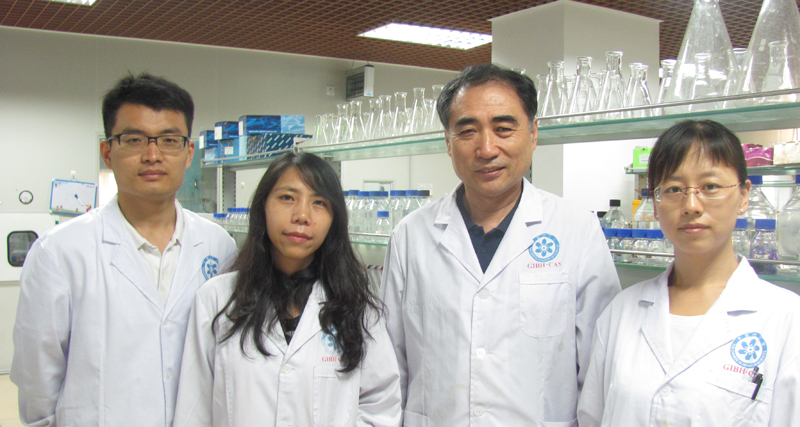 To meet the requirement for biological drug development, Guangzhou Institutes of Biomedicine and Health (GIBH) established the Biotherapeutis Lab at Drug Discovery Pipeline (DDP) in 2011. Biotherapeutics Lab is now focusing on three projects. Protein-based therapeutics with an emphasis on proteases are currently being developed for the treatment of various blood disorders. Proteases are naturally occurring peptide-cleaving enzymes that regulate a wide variety of biological functions. In the DDP, we are using the potential of these enzymes as bio-therapeutics by directing them to cleave specific proteins in the blood that promote good health. Unlike standard drugs, a single proteinase molecule can inactivate or activate thousands of target molecules, resulting in higher efficacy and lower dosing regimens compared to small molecules or antibodies. Currently, the team is developing a recombinant protein of ADAMTS13 (a disintegrin and metalloproteinase with a thrombospondin type 1 motif, member 13) for the treatment of thrombotic thrombocytopenic purpura (TTP). TTP is a serious human disease that can results in death. 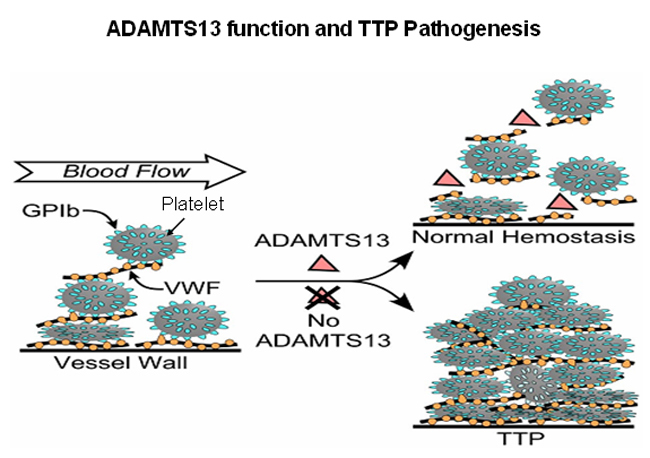 It has been discovered that TTP is caused by an ADAMTS13 dysfunction with either an ADAMTS13 gene mutation or an autoimmune response against ADAMTS13 from antibodies raised within the patients. The team has constructed different expression vectors of the recombinant ADAMTS13. These vectors are being used for expression of the recombinant protein in E. coli, yeast, and mammalian cells, respectively. Protein expression and production are fundamental steps in drug discovery and development. Four biological systems are commonly used for protein expression and production: E. coli, yeast, insect cells, and mammalian cells. Due to less post-translational modification such as glycosylation or methylation in non-mammalian cells, human and other mammalian proteins would lose their function with about 50% from those expressed in E. coli while those expressed in yeast and insect cells would lose nearly 40%. To obtain a functional protein, an expression system in mammalian cells is desirable and in many circumstances is a must. Developing a stable cell line is offten desirable if one wants to keep expression and production of the protein. However, a stable cell line construction could take as long as 4-5 months and requires a significant investment of labor and money. We are using a well-designed DNA cassette to develop a cell line platform. The cell line platform will be used for the construction of different stable cell lines based on proteins of interest. Use of this cell line platform to construct stable cell lines will save a great amount of time, labor, and money. A state of the art DNA cassette has been designed for developing the cell line platform. The team is testing the DNA cassette in mammalian cells. The most useful approach to study gene function is through gene knockout (mutation) in vivo. In some cases, a gene knockout animal is used not only for gene function studies or drug target identification, but also for developing an animal disease model which can be used for pre-clinical drug studies. The first step for developing knockout and transgenic animals is to make DNA-targeting vectors. A technology called “Recombineering” has been widely used over the world for construction of DNA targeting vectors. As Dr Daiguan Yu, Head of Biotherapeutis Lab, is an inventor of recombineering, the team has a great advantage for the application of this technology to engineer any kind of DNA for in vivo gene knockout and transgenic studies. The team has made four gene targeting vectors, including Jhdm1a, Jhdm1b, Snx17 and Adamts13. These vectors are in the process for developing ES cell clones.